For anyone who has taken high school math, the most famous Ionian is likely to be Pythagoras. His name, after all, is attached to the theorem that states: the sum of the areas of the squares drawn from the two shorter sides of a right triangle equals the area of a square formed from the longest side (the hypotenuse). But this is just a small part of the story of a man was so devoted to math that he basically created a religious cult out of it. In all likelihood, his famous theorem was not something that he invented. Rather, he learned it from mathematicians of the ancient civilizations that sandwiched the Greek world, then taught it to his fellow Greeks by way of his religious cult. 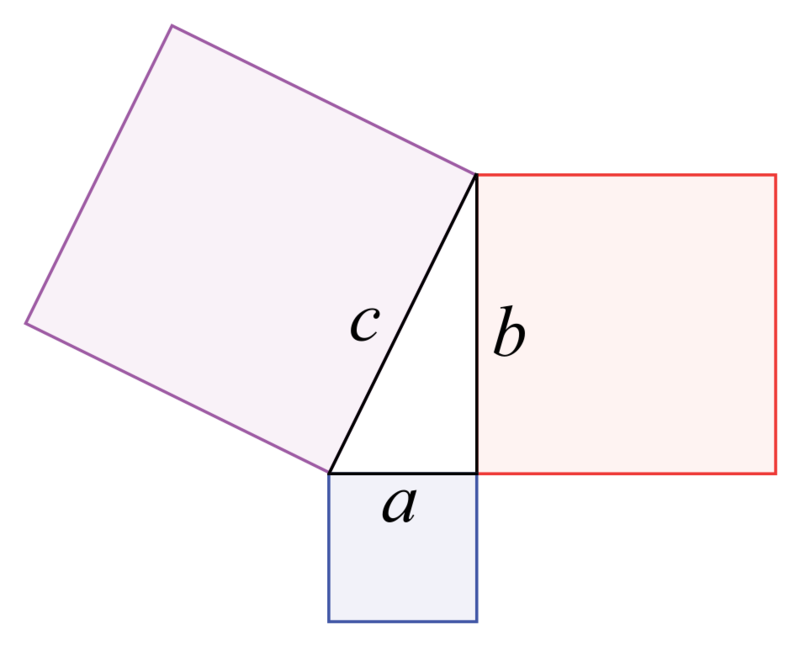 Illustration of the Pythagorean theorem. Born around 570 BCE on the island of Samos, Pythagoras was Ionian. So far, we have discussed Thales, Anaximander, and Anaximenes all of whom were located in the city of Miletus, which harbored the earliest, and initially the largest, concentration of philosophers. Pythagoras was sent to Miletus as a young man to study under Thales and Anaximander, who may also have helped finance his education. 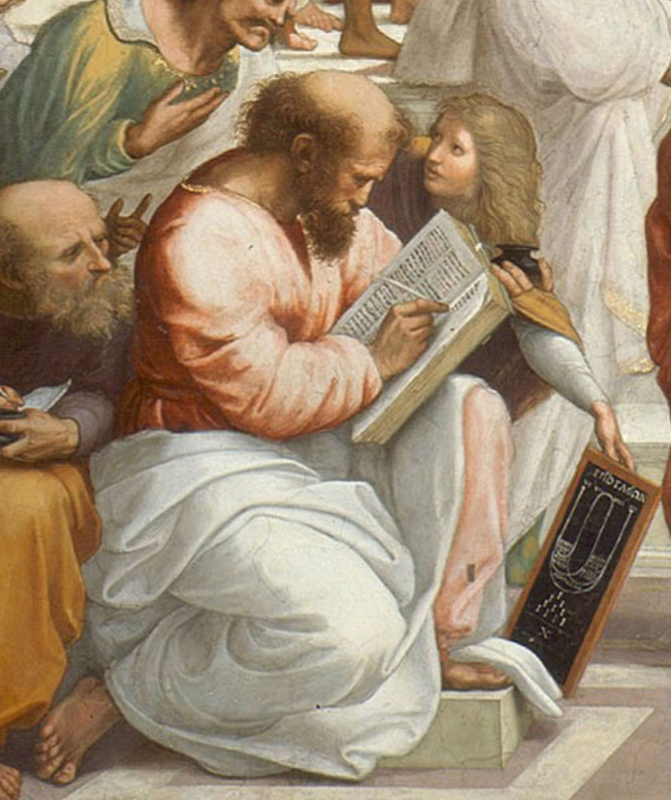 Pythagoras, detail of Raphael’s painting The School of Athens. But just as Anaximander disagreed with Thales on some points, Pythagoras disagreed with both of them and their entire approach to philosophy. Whereas Thales got insight about creation from observing accumulations of silt along the Nile and Anaximander examined fossils of ancient animals, Pythagoras came to disdain observation and use of the senses. He may accepted observation when he was young, for he is the first person known in history to say explicitly that the Morning Star and Evening Star in fact were the same object, the planet that we now call Venus. Such a realization would require careful observation, but at some point Pythagoras rejected Ionian empiricism (reasoning based on observations). Instead, he became a rationalist, someone who believed that all knowledge about the world could be derived purely by thinking. Either because Pythagoras was not satisfied with the Milesian school or perhaps to help him explore a different perspective, Thales apparently advised the young man to go to Egypt, just as Thales had done earlier in life. Pythagoras would take his teacher’s advice and set sail for the city of Memphis. There he studied with Egyptian mathematicians, who had knowledge of the proportions of the sides of right triangles and who put that knowledge routinely to practical use. Along the Nile, the theorem that Pythagoras would later “discover” had been used for centuries to mark off land holdings after each flooding by the Nile erased the previous year’s markings.Ten years after Pythagoras’ arrival in Egypt, the Persian Empire invaded and he was exiled to Babylon as a prisoner. But Babylon was even more math-oriented than Memphis. Not only did the Babylonians know of the theorem about right triangles, but they had developed it into a sophisticated system of trigonometry that had been in use for almost 1,000 years. 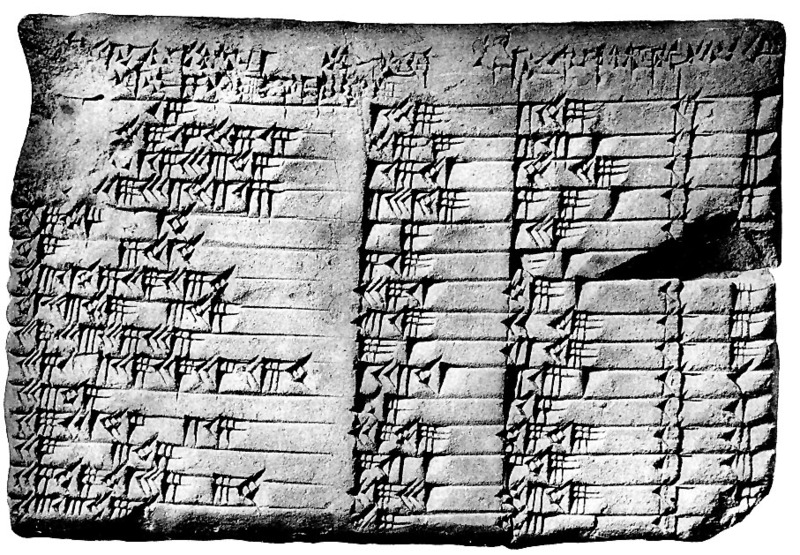 A Babylonian tablet (Plimpton 322) listing Pythagorean triples. Eventually, Pythagoras was released from Babylon and he arrived back in the Greek world with a host of mathematical teachings, looking to found his own school, but not in his native Ionia. Instead, he boarded another ship and went west to Croton, a Greek colony in southern Italy. There he created the Pythagorean brotherhood, where he taught mathematics but mixed it with theories about music, astronomy, and a range of other topics. The basic idea of his teachings was that numbers, certain geometric shapes, and musical notes were perfect entities with divine properties. He thought that the sun, moon, and planets moved in perfectly circular pathways and that the orbit of each planet corresponded to a particular musical note. Pythagoras is also the earliest person on record to say emphatically that Earth, along with the moon and planets, was spherical. As noted earlier, Pythagoras rejected observation. He did not trust the senses, believing instead that pure mathematics could reveal the secrets of the universe, so his idea of spherical worlds may have been correct for the wrong reason. The Pythagorean brotherhood, and especially Pythagoras himself, lived by all sorts of rules and regulations, some of them related to his belief in the perfection of numbers and others to the belief in the reincarnation of the soul. He had rules about how to get into bed, how to get out of bed, how to put on his shoes. Whatever motivated Pythagoras, his system clearly had a major influence on how he and his brotherhood interacted with the outside world. At some point, playing around with the Pythagorean Theorem, one of Pythagoras’ disciples figured out that the square root of two could not be determined accurately as a fraction of two whole numbers (integers), no matter how hard they tried. 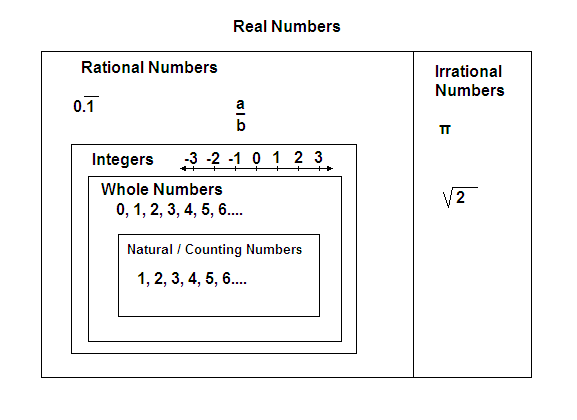 The Pythagoreans had discovered irrational numbers, the square root of two being merely the first in a whole series of such numbers that would follow. This was a major milestone in the history of mathematics. But, instead of announcing it to the outside world, Pythagoras ruled that no member of the brotherhood should reveal the information as it conflicted with his belief that the universe was built on whole numbers, not weird fractions that went on with no end. 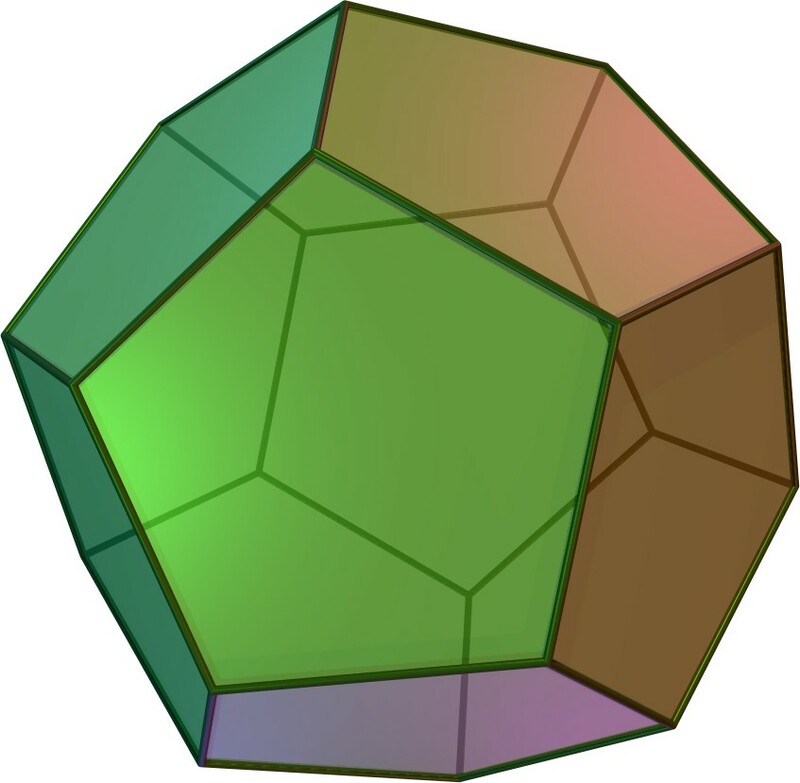 The cult members were threatened with capital punishment, should they ever reveal any irrational numbers or another secret: the dodecahedron, a solid with twelve faces, which they thought had mystical powers. There was an unconfirmed story circulating in ancient times that Pythagoras had gone farther than threatening death and actually murdered the disciple who had made the square root of two discovery. Decades after Pythagoras’ time, later Pythagoreans would come to identify the dodecahedron with the quintessence, the fundamental element of existence that connected the four known elements of air, water, fire, and earth. Ultimately, the Pythagorean ideas about shapes, perfection, rationalism, and rejection of empirical methods would be picked up by the Athenian philosopher Plato, who helped to smother the proto-scientific thinking that had enjoyed a brief, shining moment in Ionia.